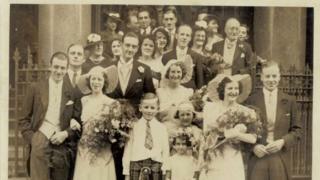 Image caption Effie's wedding including "Uncle Harry" and "Aunt Annie"
Police are trying to solve the mystery of a set of old photographs which were found in Glasgow. The black and white pictures appear to be treasured family heirlooms and officers believe they will have significant sentimental value. The snaps, dating from the 1940s and 50s, were found at a department store. The largest is of a wedding party with a handwritten note on the back saying "Effie's wedding (Mother's sister who died in London bombing 1941)". It includes names of some of those in the photo including "Uncle Harry" and "Aunt Annie" and also printed on the back were the words "The Knightsbridge Photographic Bureau 245, Knightsbridge, S.W.7". Four smaller photos with the words "Millport 1952" written on the back show groups of children called Moira, Grace, Helen, Rosemary, Janice and John. The photographs were found in the John Lewis store in Glasgow in October last year. Image caption Names on the back of the photos included Moira, Grace, Helen, Rosemary, Janice and John.